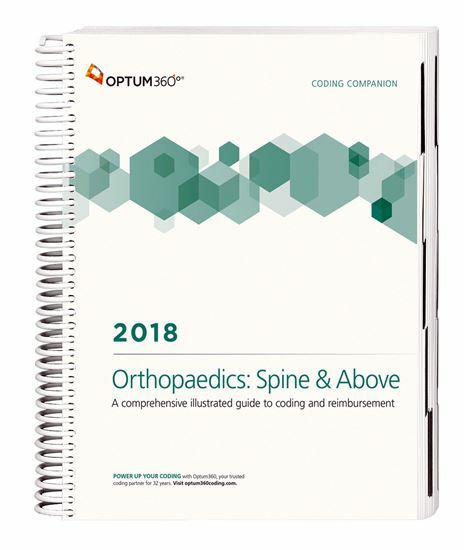 Consolidate the coding process with theCoding Companion, your one-stop resource developed exclusively for those who code orthopaedics. This comprehensive and easy-to-use guide includes 2018 CPT®, HCPCS, and ICD-10-CM code sets specific to your specialty. Each specialty-specific procedure code includes its official description and lay description, coding tips, terminology, cross-coding to common ICD-10-CM, and relative value units. Getting to the code information you need has never been so easy. • New — Code icons. Quickly identify new, revised and add-on procedure codes related to orthopaedics. • New — CPT® Assistant references. Identifies that an article or discussion of the CPT code has been in the American Medical Association’s CPT Assistant newsletter. Use the citation to locate the correct volume. • Optum360 Edge — HCPCS procedure codes. Only Optum360 offers HCPCS procedure codes specific to your specialty with the same information as we provide for CPT codes. • Quickly find information. All the information you need is provided, including illustrations, lay descriptions, coding tips, terms, cross-coding, Medicare RVUs and Pub. 100 references. • Organized by CPT® and HCPCS procedure code. Essential procedures for orthopaedics are listed by CPT® or HCPCS procedure code, along with crosswalks to common ICD-10-CM diagnosis codes. • Easily determine fees for your practice and reinforce consistency in the charges. Relative value units including the practice, work, and malpractice components with total RVUs for non-facility and facility for procedures are included. • Avoid claim denials and/or audits. Medicare payer information provides the references to Pub. 100 guidelines, follow-up days, and assistant-at-surgery. • CCI edits by CPT® and HCPCS procedure code. CPT® and HCPCS procedure codes with associated CCI edits in a special section and quarterly updates available online.